Camouflage is a way of blending in with the terrain, but when displayed in your home on camouflage windows curtains, these designs will truly stand out. If you are a military enthusiast or know someone who is, decorate with military-themed camouflage windows curtains and drapes. Do you prefer jungle camouflage, with dark green, brown, gray, and tan splotches mixed together? Or desert style camouflage, mixing together different shades of tan and brown? Perhaps nature is more your style--well we've got that going on, too. You can now admire the creativity of nature by decorating with custom camouflage window curtains that showcase the amazing ability of animals to disappear into their surroundings. Keep your artistic side alive and personalize your own camo window curtains with images and message to your heart's content. How about an up-close photo you took of a green lizard clinging to a huge leaf of the same color? Another master of natural camouflage is the zebra, and we have window curtains that show the black and white stripes of these graceful creatures. Alter the luminance of that black and white for a clean and stark look, or just change the color completely for a reimagined zebra in blue and pink. We've got custom sized window curtains with those classic patterns in any color you can conjure up. With such a variety of camouflage color schemes, you can choose full block-out curtains in bright colors to keep the sun at bay. Or, try for drapes in military hues to style with toughness and focus. You can even try valances in multicolored subdued hues to highlight other aspects of a room without sacrificing your window style. VisionBedding's camouflage window curtains can create a theme in any room with windows. Let each window have a different style and color for an eclectic and conversational look. Try a whimsical selection of rainbow custom colors in your child's room, or a chic and elevated style of subdued golds and silvers in the living room. If you're a big fan of hunting, make every decor item in a room camo themed, and put the finishing touches on with curtains that will blend right with your wall mural. 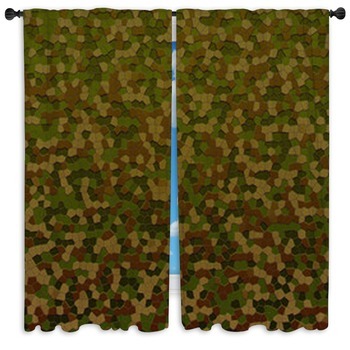 These window curtains are perfect for any prospective military members in your family. On one design, you'll see a sniper posing with his gun while dressed in an outfit made to look like dry brown grass. Boys will love a set of window curtains featuring two pretty girls wearing camouflage bikinis, with one of them in camouflage combat boots and the other in a camouflage headband. Stand out from the background with VisionBeddings window curtains--we know that the last thing you want to hide is your style.